Sky maintained their superb form this season on the seventh week of the VPCCL against Regents. Under bright sunshine Regents opted to bat first hitting a commendable 128-3, David Campbell continuing his form striking a fluent 36. However Sky's response was swift and brutal reaching their target in 10.2 overs. Noz Hussain and Asif both finished on 51 before Hodane Bryce struck some huge sixes finishing unbeaten on 23. Best Nationals struggled to get going against Rose & Crown on pitch 2, finishing on 102-5, Sajid Rehman top scoring with 29. Rose & Crown had little issue in their chase, hunting it down inside 11 overs, Paul O’Hegarty unbeaten on 41 and Sam Wildy (37) top scoring. Tuesday saw one of the favourites suffer their first defeat of the season as Friends were swept away by Old Fallopians XII. Opting to bat first, Friends found themselves in all sorts of trouble thanks to some superb catches in the deep, collapsing to 60-5. It took a last wicket partnership between Shrukh (29) and Mohit (24) to scramble Friends to 115-7. OF, eased home in the chase, Ali Shah (50) and Farhad Waqar (27) helping them to a comfortable victory in 10.3 overs. London fields hit an ominous 163-4 on pitch 2, Rarath (37) and skipper Will Isaac (31) top scoring. Mile End Tailenders ended up falling short on 144-6, despite spirited batting from Wolson Bidgy (51) and Sanj Gunewardene (27). 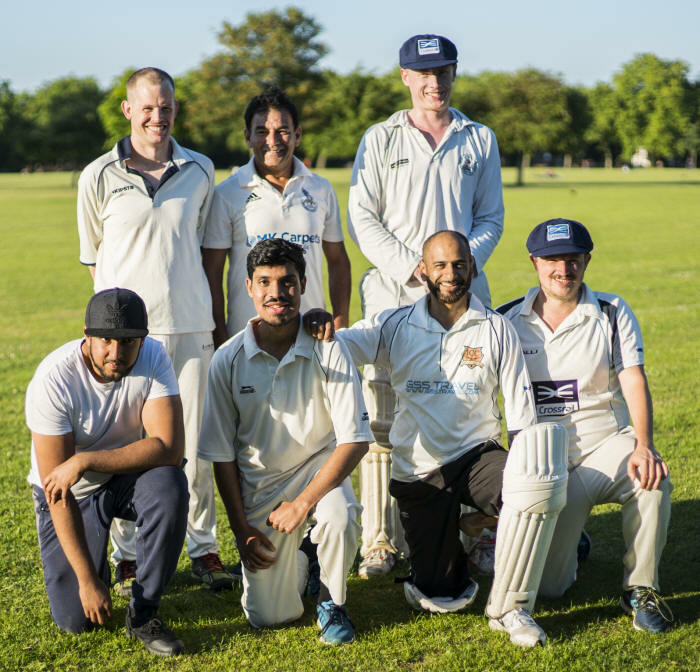 Wednesday saw the London Tigers smash the highest score this season, walloping 222-5 against Stokey Scoundrels. Azlan (55), Mohammed Ripn Noor (50) and Rikter Khan (35) all on top form. Stokey struggled in response to a superb spell from Jamil Ahmed (4-22). Sarafat Ali top scoring with 38. Millwall and Bansko Bears enjoyed a close encounter on pitch 3. Millwall posted a tricky 155-7, not helped by three run outs but thanks to Farhan Ahmed who hit 50 off the final ball of the innings. Bansko fought hard chasing but fell just 12 runs short. Opening batsmen Andy Butel (42) top scoring before being run out by the skipper as Bansko finished on 131-4. Tuesday saw Dan Venn (53), and Michael Redfern (43) in form for Crossrail as they hit a composed 143-5. Despite a spirited 19 from Freddie Morris, Broadway struggled to get going and were bowled out for just 81. Trent was the hero for Ex-Pats as they produced a superb comeback to defeat Masiha on Wednesday. Batting first Masiha hit 148-6, Sheldon Greenland in dazzling form as he returned to the crease and hit several big sixes in a superb knock of 76. Ex-Pats made a slow start and were way off the mark despite 51 from Hicks, who remains unbeaten all season. However the tide turned as Trent Bryne became the man of the moment striking five sixes in one bizarre over that also saw a no ball and a dog stealing the ball. Trent eventually finished on 55 leading Ex-Pats to victory. Old Fallopians 2nd VII struck a reserved 119-5 against L&Q Living Ollie Gold (49) top scoring. L&Q had little issues hitting 120-3 in 13.4 overs with Sanger Sunny hitting a commanding 50. Victoria Lounge eased past Camel Lights on pitch 2. Camel Lights recovered from losing three early wickets to finish on 114-4, Avinsh (45no) and Dave Melia (36) top scoring. VL made light work of the chase, strolling to 118-1 in 13.5 overs. Homerton left it to the last over to defeat Mad Marrocas in a tight match on pitch 3. Robbie Jacobs (46) and Tobias Phibbs (28) led the charge for Mad Marrocas as they finished on 141-3. However a superb knock from Larry Hutchinson (53) and unbeaten 39 from Hoff helped Homerton to win it with a six in the final over finishing on 142-3.